Decent breeze for the race but not quite as free as anticipated so looking forward to a beat down the Solent. Over the line with Black Diamond and quickly tacked away to get some clean air as they hugged the Island shore all the way to Hurst. We moved out into the main channel in search of better tide and wind but the breeze was fairly fluky and changed direction in the gusts and lulls. 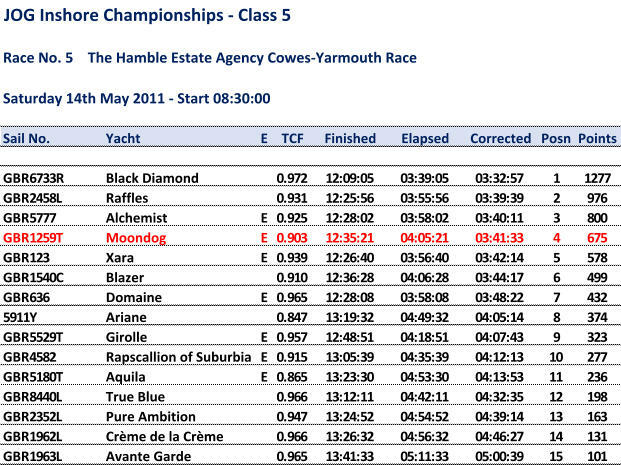 Looked fairly good on the fleet with only the higher raters ahead. Tacked at the first mark (South West Shingles with Blazer in close attendance and swapped positions with them up to Christchurch ledge, including one a rather closer than necessary accompanied by some raised voices. Spinnaker up on rounding the mark and on to North Head where held our course to get in close to the beach and out of the adverse tide up to the corner. Kept to the main land side of Hurst until we had to round The Trap and in the process managed to wrap the spinnaker but soon resolved. At this point we were passed by Alaris (Class 4) and managed to hitch a ride on her stern wave for a ride most of the way across the tide towards the finish at Yarmouth. Bit of detour around the ferry but not much time lost with an fourth place on corrected.